Bob Kelly learned a lot about diversity during his time at Vincennes University. Thirty-eight years later, he's using those experiences in an effort to address bullying. 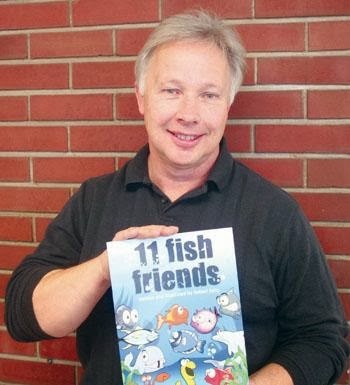 Kelly, a graphic artist, has written and illustrated a children's book, "11 fish friends," based on his experience in a fraternity at Vincennes University. The Seymour native, who moved to Shelbyville after living in Cincinnati for 25 years, was a member of Sigma Phi Epsilon at Vincennes in the mid-70s. * "We never met before, different nationalities, different ethnicities, short, tall, good-looking, ugly," Kelly joked about his fraternity brothers. "Thirty-eight years later, we still see each other. "It really taught me about never passing up the opportunity to make a friend. We were the most diverse population you can imagine ... we learned you accept everyone for who they are." That mentality was reflected in Kelly's thinking as he saw news reports about bullying while living in Cincinnati. He began to ponder how to use his own story. "When I was running that by a few people, teachers, they said, 'Bob, what you've got there is the beginning of an anti-bullying book.'" Once the book was finished, he sent out PDFs to promote it to gauge interest. When it was time to actually publish the book, the first print run was paid for by his fraternity brothers. Kelly said the book is being used in the Dugger school system here in Indiana and in the Rocky Mount school system in North Carolina. He's also sold about 75 books to parents and grandparents through his Facebook page, facebook.com/HoobieBooks. The book is also available on Amazon.com. Cost is $8. Andy Proffet is a staff writer for The Shelbyville News. He can be reached at aproffet@shelbynews.com. Follow him on Twitter @AndyProffetTSN.